There was a time when extra pocket money meant cleaning the car, dusting the fireplace or being elbow-deep in hot water while standing on a plastic footstool. 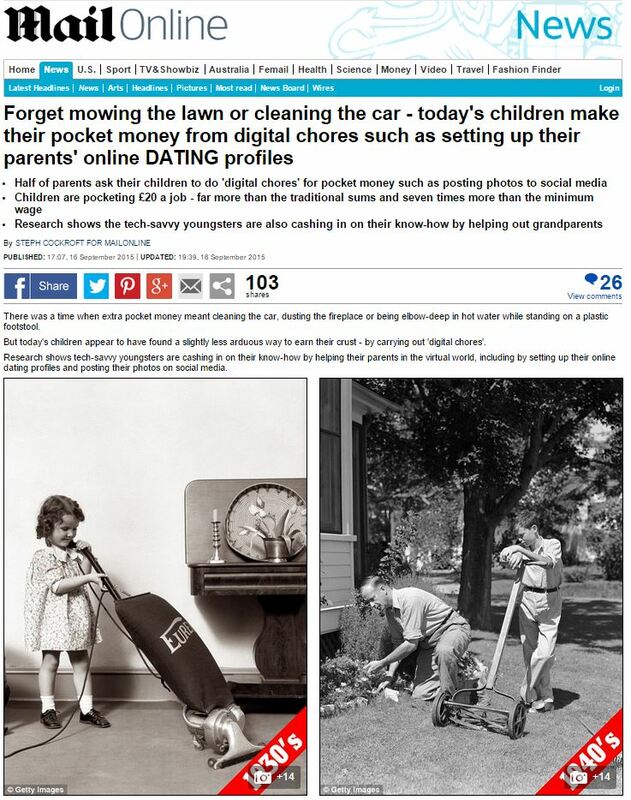 But today’s children appear to have found a slightly less arduous way to earn their crust – by carrying out ‘digital chores’. Research shows tech-savvy youngsters are cashing in on their know-how by helping their parents in the virtual world, including by setting up their online dating profiles and posting their photos on social media. Giving a child pocket money to buy sweets as a reward for doing household chores is a thing of the past. Doing the dishes has been replaced with iPod duty, according to research from Barclays, which has released a mobile banking app for 11 to 15-year-olds. Are parents really abandoning traditional chores and making their kids do new, modern-era digital chores to earn pocket money? Or is this just a transparent attempt by a bank to promote their new ‘move into the digital age’ banking app for kids and their pocket money? “We are moving into a digital age and hope that the app will help support parents across the country in encouraging their children to take responsibility for their pocket money earnings,” said Barclays’ Luke Christoforidis. So transparent, even a child could see through it. 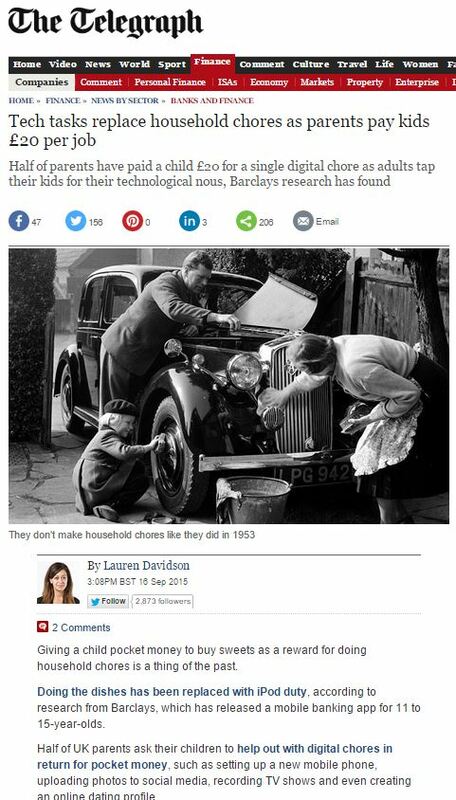 This entry was posted in Barclays and tagged barclays, daily mail, Lauren Davidson, Luke Christoforidis, STEPH COCKROFT, telegraph on October 19, 2015 by Michael Marshall.